A Rare Lake View Gem on Stunning Campbell Cove Lake! A fisherman's dream with over 9 species of fish on this pristine 70 acre lake overlooking panoramic layered mountain views. Minutes to whitewater rafting on the Ocoee river and a short drive to Blue Ridge GA. 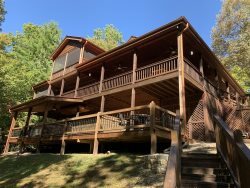 Enjoy this comfortable and inviting 3 bedroom 3 bath cabin with open floor plan. Rocking chair front porch overlooks lake and mountain views with breathtaking sunsets. Living room has wood burning fireplace. Spacious open kitchen and dining area, plenty of countertops and cabinetry. All paved roads to the cabin. * Dock access is included though it is quite a hike to the small dock.You are welcome to bring your kayak, canoe or raft just understand that you do this at your own risk and absolutely nothing is to be left on the dock or along the way to the dock and lake. •Private Dock Access- Use at your own risk. *Please note that it is a 2-300 yard walk down to the dock (which isn't visible from the cabin). Nothing is to be left on the dock, so anything you take down there needs to come back with you or additional cleaning fee will be charged.